Skin physiology and skin barrier function are present and maintained: the cosmetic product needs to pass a functional stratum corneum to be efficient. The penetration capacity of the tested product is crucial. Testing topical applications in situ: we can test formulated ingrediens but also finished products, under realistic conditions of use. 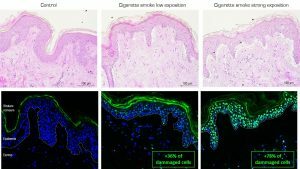 A skin model that comes close to in vivo conditions: results obtained on skin explants increase the possibility for success during clinical trials. Ex vivo tests provide a final step before clinical evaluation. In our laboratory, we work with the NativeSkin® skin model (Genoskin), a skin explant obtained from plastic surgery, which is kept in a state of survival for 7 days to allow ex-vivo testing over a longer period of time. 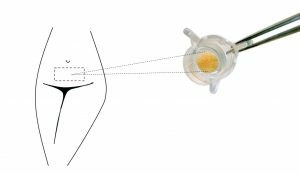 NativeSkin® is a full-thickness skin biopsy embedded in a solid and nourishing matrix while its epidermal surface is left in contact with air. The skin biopsy is firmly embedded in the matrix to prevent the lateral diffusion of topically applied formulations. We carry out cosmetogenomic screening on skin explants. The results obtained on this kind of study give access to the metabolic pathways implicated in products activities and help to guide their development. Syntivia also provides analysis on a wide range of biomarkers by immunohistochistry. 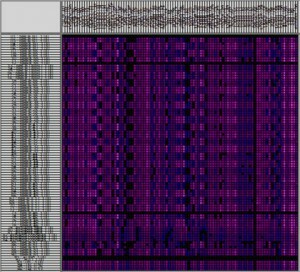 This type of study allows to validate effects obtained during genomic study, for example. Protein analysis also helps to obtain high-quality images and a reliable quantification of skin biomarkers to better understand skin physiology. To test potential preventative or curative effects on the skin, Syntivia includes a range of stressed models, which have been exposed to different type of external stress. The following picture presents the effect of 2 doses of cigarette smoke exposition on skin explants. The damages can be prevented or cured by an active ingredient. Response of skin explant to low and high exposition to cigarette smoke: Hematoxylin – Eosin coloration shows the progressive disorganization of the dermis and epidermis as well as the weakening of the dermal-epidermal junction. The gH2AX labelling in green shows the appearance of DNA damages which increase with the dose of cigarette smoke. This kind of model allows the evaluation of protective and/or curative products able to counteract deleterious effects on the skin. Syntivia also conducts custom experiments to study a specific activity. In the following picture we quantify the pro-pigmentation effect of an active ingredient ex-vivo, directly on the skin explant. Skin explant treated with a pro-pigmenting product 2 times a day during 7 days. 3D Modeling of skin appendage and compartments. 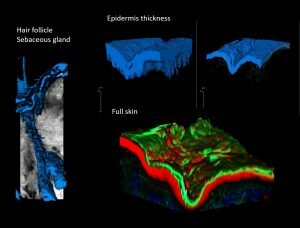 3D imaging is a powerful tool to study new skin aspects and product actions but also offers invaluable support when communicating on product efficiency. For more information on these evaluation techniques, don’t hesitate to contact us. The Syntivia team will be present at InCosmetics on April 7th to 19th. If you’d like more information on our tools and expertise, please feel free to contact us. We’re already looking forward to meeting you there.